In An International First, Surfer Chris Bertish Conquers The Atlantic Alone On A Paddleboard : The Two-Way Chris Bertish set out from Morocco to become the first to make the crossing alone on a stand-up paddleboard. On Thursday, after 93 days, he paddled into the West Indies, with a whole ocean behind him. Chris Bertish enters the English Harbour at Antigua on Thursday, a flare trailing behind him in celebration. He paddled more than 4,050 nautical miles to reach this point. In the span of 93 days, Chris Bertish crossed more than 4,050 nautical miles of Atlantic Ocean — and he conquered this lonely crossing standing up. 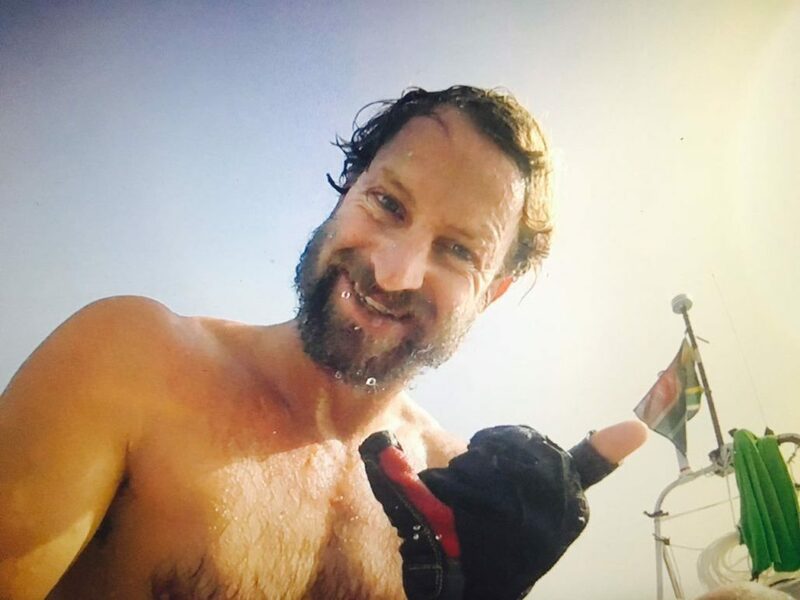 When the South African surfer entered English Harbour on the island of Antigua on Thursday, he was riding the same massive stand-up paddleboard that bore him from Morocco's Agadir Marina roughly three months ago. Still, if Bertish's equipment wasn't much different from when he started, his place in the record books now certainly is: On Thursday, Bertish became the first person in history to make a solo trans-Atlantic journey on a stand-up paddleboard. "Across the entire Atlantic Ocean and I am finally here," Bertish wrote Thursday on Facebook. "I don't need to be strong and keep it together any longer; it's been 93 days and it's done and I let it all go... I am home!" By the time he made it to the West Indies, battling fittingly windy and rough conditions," SUP Magazine reports he had already faced down "shark encounters, equipment failures, unfavorable trade winds, loneliness and huge swells." At one point, conditions were so rough — and rough for so long — that he and his navigational systems were "just really embattled to just make it through and survive," Bertish told SUP Magazine in a phone call about halfway through his trans-Atlantic paddle. "My craft was taking on water, I couldn't open my hatches, I was underwater most of the time and I don't think most people understand the severity of that kind of problem," he continued. "I have a sea grass growing on my entire deck because it's underwater the entire time." But it wasn't all hardship. 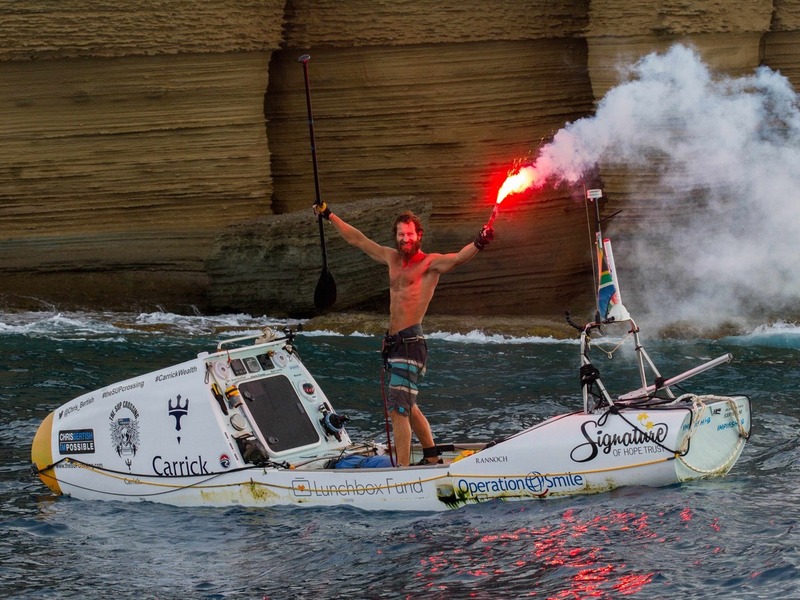 There were high marks, as well: Bertish says he smashed the records for longest distance paddled alone across open ocean, and for the longest distance paddled alone in a single 24-hour span — 71.96 nautical miles, nearly doubling the previous mark. However rough the going on the open water, it's never too rough to throw up a shaka sign, as Bertish attests in this midvoyage selfie. He says he paddled about 60 miles in his last full day on the water alone. Now, as we noted in December, Bertish's vessel isn't exactly your granddad's stand-up paddleboard. The 20-foot-long behemoth — which he calls ImpiFish — boasts satellite weather forecasting equipment, handheld radio and GPS, solar panels and a tiny cabin where he could sleep at night. And he's been sure to relay updates to landlubbing supporters on Facebook. Those same supporters helped Bertish in his quest to parlay his paddling into charity. He says that as of Thursday, his journey had managed to raise more than $490,000 for Signature of Hope Trust, The Lunchbox Fund and Operation Smile. "Bertish aims to raise enough money to build at least five schools in South Africa, provide monthly dividends to feed and educate thousands of children and pay for surgeons to carry out life-changing cleft lip and palate operations," CNN reports. "I pretty much ate exactly the same thing every single day for 93 days," he told a crowd assembled to greet him Thursday, as he was settling down to his first meal on land in quite a while. "A lot of the kids we're doing this for don't even have enough money to go to school." Bertish added: "Every time I'd look down at the same packet of food I was going to have to eat another day in a row, I tell myself: 'Shut up, you've actually got food to eat.' These kids have nothing." He reminded the gathered crowd just how lucky they were to have anything to eat at all ... until, his reminder spoken, the crowd politely told him to shut up and just eat his burger — his first after an ocean's worth of paddling.